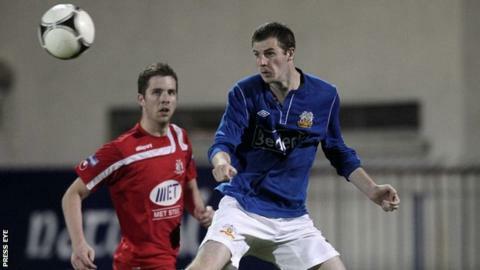 Mid-Ulster rivals Glenavon and Portadown had to settle for a point each as Monday's derby ended in a draw. Ports skipper Keith O'Hara ran clear to shoot in a 25th-minute opener. Glenavon equalised four minutes later when Conor Hagan's header hit the post, and Ports player Richard Leckey, before going in off keeper David Miskelly. Ciaran Doherty fired Glenavon into the lead on 73 minutes and Joe McNeill equalised with a shot which deflected off defender Brendan Shannon. So Glenavon, who had won just two of the previous 25 clashes against their derby rivals, are still seeking their first win of the season. They have three points from four matches and stay in 10th place while Portadown move up to sixth place. Portadown boss Ronnie McFall was not satisfied with is team's display. "We did not perform as well as we can," he said. "But we have a lot of players out injured and as the season goes on we will get stronger." The opening goal was created by a superb threaded through pass by Kevin Braniff which O'Hara ran on to, taking one touch and then directing a left-foot shot past Andy Coleman. The lead did not last long as Kyle Neill's free-kick in from the right was flicked on by Conor Hagan and the ball hit the far post and bounced against Leckey before going in off the unlucky keeper Miskelly. Glenavon player-manager Hamilton almost put the Lurgan men in front but his header was blocked by Ross Redman. It was Hamilton, though, who made the goal which put his side into a 73rd-minute lead. He got the ball over from the bye-line on the left and Doherty netted with a first-time shot. Portadown grabbed a point thanks to McNeill's deflected effort in the 82nd minute.